LED Picture Frame. Design Your Own LED Photo Frame. Made In The UK. See your favourite photos light up with this beautiful LED picture frame or personalised photo light box. Handmade in London from FSC wood, this elegant yet fun LED photo frame will add a pop of personality as well as a handy light to your bedside table. Choose from a chic matt black or a glossy white frame to surround your photo. The LED light panel shines behind your photo, creating a beautiful effect you can dim. Control the strength of the light through the built-in dimmer. The handy stand makes it easy to prop your backlit frame up on any surface. See your favourite photos in a whole new light with a personalised LED picture frame. 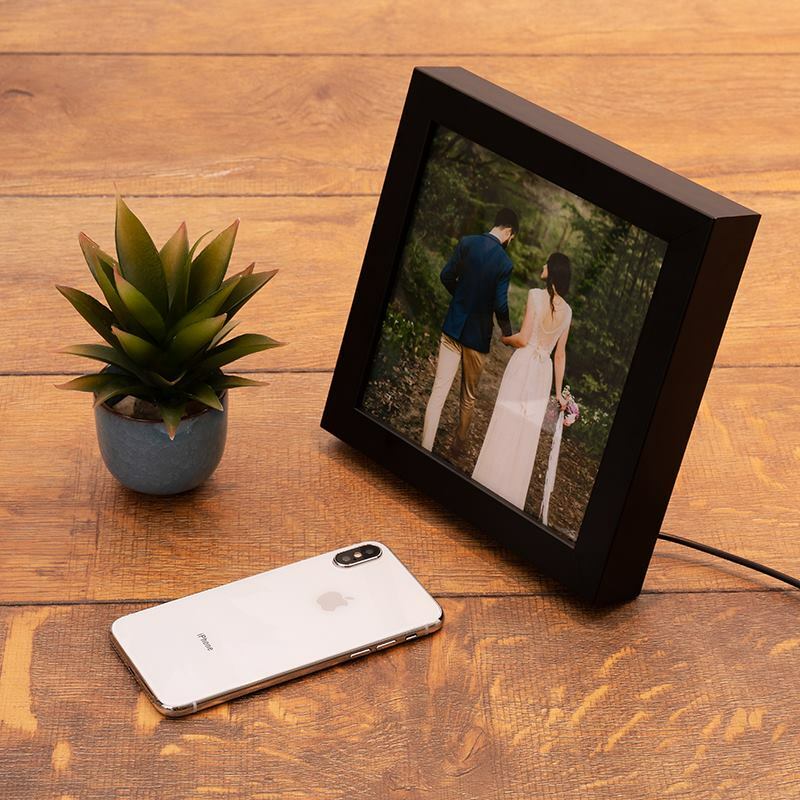 Handmade at the Bags of Love studio in London, this dimmable lamp photo frame is made from FSC wood and is available in matt black or glossy white. The size of your new photo frame is ideal for bedside tables, desks or even coffee tables. It is fitted with a built-in dimmer, on/off switch, so the level of light can be changed depending on your requirements. Your photo is printed with the backlight behind it, so the LED seems to light it from within. The panel is made from a shatterproof acrylic, which will add shine and durability to your frame. This original frame looks stunning with the light turned off, but particularly striking when it is turned on. It will make a wonderful addition to your home or work and is a memorable and heartfelt gift to someone special. Who Would Love An LED Photo Frame? Anyone who loves showing off those special photos would love to receive their very own personalised LED photo frame. It makes a great gift for both newlywed couples and for those celebrating their anniversary. If you are looking for a way to add a little light to your bedroom, but are short on space, then this photo frame is ideal. You can print a photo that means the world to you and enjoy the glow of the LED backlight. Use the dimmer to create the right ambience for your mood. Why not create a personalised night light for your little ones? If they are a little scared of the dark, then the gentle glow of this frame, complete with a comforting photo of mum and dad means they can say "goodnight" without any fear. Get your mini light box with photo by pressing start design above and we'll take care of the rest. It can also be a brilliant baby bedside lamp – because is dimmable and comforting for baby and toddlers. When you design your own LED photo frame, it is made from scratch at the Bags of Love studio in London. Our skilled teams of designers, technicians and makers work together to ensure you receive a completely unique, one of a kind product that has been lovingly handmade. Your photo is printed against the back lit LED light. We then use FSC wood to create the frame, in your choice of matt black or glossy white. The dimmer switch is added to the back of the frame. This can be used to adjust the brightness of the LED, as well as turn the light off and on. Two metres of cable connects to the frame, along with a plug for easy installation. Care: If your framed photo light gets a little dirty or dusty over time, you can wipe it clean with a dry or slightly damp cloth. The acrylic panel is shatterproof and very durable, so is easy to clean. Your photo is printed against the LED backlight. For your photo to truly glow, consider the colours and composition. Brighter hues will look even more vibrant when lit up by the LED. The actual size of the print is 15 cm x 15 cm, so we recommend using a single image where details are slightly larger. If you choose to create a photo montage, smaller details and fine lines might not look as impactful. You can choose from a glossy white or a matt black frame. Have a think about your decor and the style of the room where you want to place your LED frame. The black is bold and powerful while the white is softer and more neutral. These frames are very special, and as such, we believe you should use them to frame your most precious photos. A favourite is wedding photos. Print a stunning picture of the newlywed couple and opt for the black frame to complement the suits. The LED light will make the couple look even more spectacular and "glowing." Another lovely image to use is that which has a sunset or sunrise in it. If the photo looks vibrant unlit, then imagine how powerful it will look with the LED light behind it. Chose your favourite photo and have it printed into one of these stunning acrylic photo blocks. Great for any room! Create a photo frame, which is as unique as you! We’ll print your photos or designs on our Personalised Photo Frame.